Next week I'm off to Italy, Switzerland, and a tiny bit of France with my mom and sister. It has definitely creeped up on me and I'm no where near ready so I decided to put together a packing plan. I actually told my sister my plan was to pack everything to fit into a carryon size (wishful thinking) so that there would be plenty of space remaining in my full size luggage to bring back finds! Last year I was impressed that I was able to get everything down to one suitcase...and I still didn't wear everything! So my idea isn't completely out there?!?! 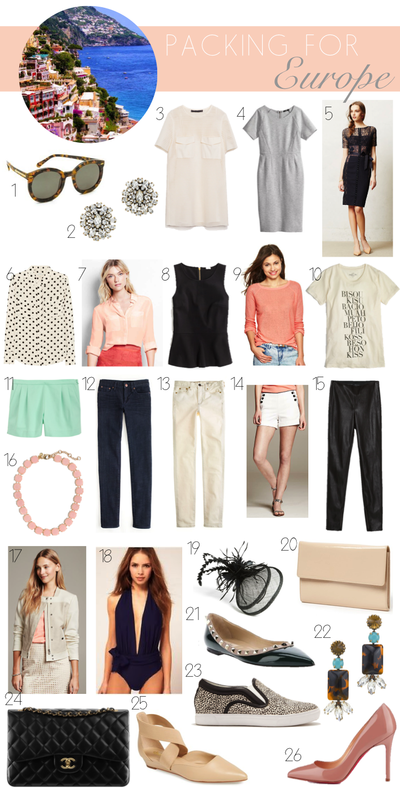 Ive stuck with neutrals that can easily mix and match with a few spring colors mixed in. Also the fascinator....I need opinions on this one. While in Italy we're actually attending a wedding and I kind of want to wear one. I know that this is technically a brit thing, but I feel this may be my only chance to channel my inner Kate?! Too much? I worked with mainly things I already own and a few I'm hoping to have time to pick up this week! Where are you going in Italy and France? Sounds amazing. We went last year and I decided I was going to pack just a carry on and wear all black. Not as stylish as all of your picks. I think your outfits look great! Your upcoming trip sounds fun! When I went to the UK earlier this month, I had the same idea to fit all my clothing in my carry-on so my checked luggage would be empty for shopping! It worked! These pieces are amazing! What a great trip you have planned! You should 100% wear/get a fascinator! When in Rome! ;) safe travels! Such a lovely packing list, we love the versatility and the easy mix and match!